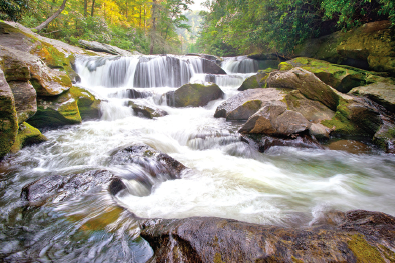 The Chattooga River in Western North Carolina was designated as a Wild and Scenic River in 1974. The act has preserved 12,754 miles of pristine river in 40 states and Puerto Rico. MountainTrue partnered with American Rivers, American Whitewater and New Belgium Brewing to host a celebration of the 50th anniversary of the act, which was passed by Congress and signed into law by President Lyndon B. Johnson on October 2, 1968. The act established a process to designate rivers with “outstandingly remarkable scenic, recreational, geologic, fish and wildlife, historic, cultural, or other similar values” for protection from development that would harm their wild or scenic character or their recreational value. Of the six Wild and Scenic Rivers in North Carolina, five wind their way into or through our western part of the state. On September 28, event attendees celebrated at New Belgium’s Liquid Center in Asheville where they watched a short river film, heard from local conservation and water advocates and took part in an advocacy activity asking Congress to reaffirm their commitment to protecting our Wild and Scenic Rivers. You can still take action here!